This is an integral concrete farmhouse sink. Concrete Apron sinks or Concrete Farm Sinks, as they are commonly called, are reminiscent of the sinks once common in rural kitchens. A concrete apron sink can be the perfect addition to a country kitchen while it adds a distinctly rustic element to even modern kitchens without looking out of place. It has a massive look that complements concrete countertops. The concrete apron sink has all the benefits of a traditional undermount sink, a simple style and easy cleanup. An apron sink provides ample depth for large pots and pans and has a front that protrudes from the cabinet face. The size of the exposed face of the sink can be customized to add as much beautiful concrete to your design as you wish. A concrete apron sink can be any size for your kitchen, bathroom or washroom. 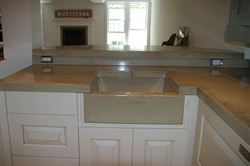 Your custom concrete apron sink can be single or double bowl. Faucet openings are not commonly part of the sink and allow any number of faucet configurations. The exposed front can have inlays or other decorations for that personal touch.